Iran's Revolutionary Guard holds war game simulating the capture of the Al-Aqsa Mosque from Israel. Thousands of paramilitary forces from Iran's powerful Revolutionary Guard held a war game simulating the capture of Jerusalem's Al-Aqsa Mosque from Israeli control, The Associated Press (AP) reported, citing Iranian state media. The Iranian forces reportedly stormed and "liberated" a replica of the mosque as part of the exercise. 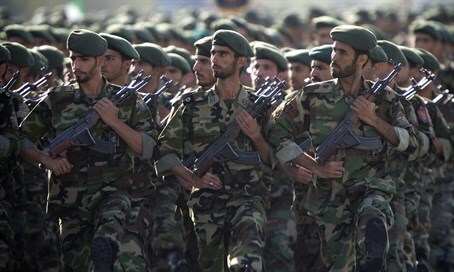 120 brigades from the Basij, the paramilitary unit of the Guard, reportedly participated in the exercise, held Friday outside the holy city of Qom in central Iran. The symbolic operations were backed up by Guard helicopters, drones and Tucano planes that bombed hypothetical enemy positions before ground troops captured the replica of the mosque set up at the top of a mountain, according to AP. Ironically, the Guard set up a replica of the gold-topped Dome of the Rock which is located near the actual Al-Aqsa Mosque. Official photos showed one of the troops going to the top of the dome and waving an Iranian flag and a red-colored flag, a symbol of martyrdom, the news agency reported. General Amir Ali Hajizadeh, who heads the Guard's aerospace division, said his force deployed Shahed-121, or Witness-129, drones during the war games. The drone, unveiled several years ago, has a range of 1,700 kilometers (1,050 miles), a 24-hour nonstop flight capability and can carry eight bombs or missiles. Iran frequently expresses solidarity with the Palestinian Arabs and holds an annual "Jerusalem Day" (Al-Quds Day) each year on the last Friday of the month of Ramadan. On that day, rallies are held around the world which have been used to disseminate anti-Israel propaganda and incite to violence against Israelis and Jews. Iranian leaders verbally attack and threaten Israel on a regular basis. Iranian President Hassan Rouhani recently declared that his country views Israel as “illegitimate”. Earlier this year, Rouhani claimed that Israel creates the "greatest danger" in the region, after Prime Minister Binyamin Netanyahu detailed in Congress detailed how Iranian aggression is wreaking havoc in the Middle East. Shortly after being elected in 2013, Rouhani called Israel an "old wound" that "should be removed" , though Iranian media later claimed that Rouhani’s remarks were distorted. Similarly, Iran’s Supreme Leader, Ayatollah Ali Khamenei, has called for the destruction for Israel and recently threatened that Israel would cease to exist within 25 years.